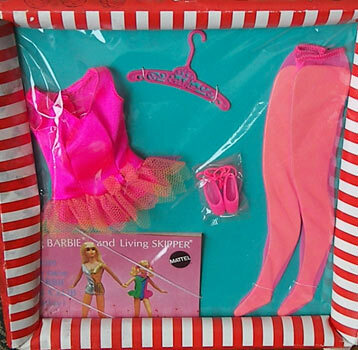 Barbie's mod ballerina ensemble features a very bright hot pink satin body with an attached tutu made of multiple layers of yellow, orange and hot pink tulle. The hose at hot pink and sheer and the ballet shoes are hot pink as well as the ties. All of Barbie's tutus are very easy to revive by separating the individual layers of tulle. They get mashed together over the years. This ensemble can be harder to find.